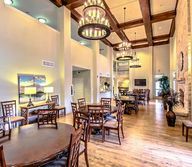 Description: Luxury Leander, TX senior living is waiting for you in this one bedroom, one bath apartment which features a walk-in closet with built-in organizers. Description: This luxury one bedroom senior apartment at Leander Station Senior Village has a gorgeous sun room with additional storage and a huge walk-in closet. Description: 1 Bedroom - 1 Bath with separate Dining Room- Offering a separate dining room with an adjacent sun room, this senior apartment in Leander, TX is perfect for hosting Sunday family dinners. Description: This lovely one bedroom, senior casita apartment in Leander, TX offers a gourmet kitchen with granite countertops and an optional garage which can be leased as well. Description: You'll have room to have family come visit in this two bedroom, luxury Leander, TX senior apartment which offers stainless steel appliances, and faux wood flooring in the living room and kitchen. Description: This two bedroom, two bath apartment features a separate dining area off the kitchen and also has an optional no-access attached garage. Description: Gorgeous details like granite countertops, built-in closet organizers, and plush carpeting in the bedrooms make this apartment the perfect place for Leander, TX senior living.